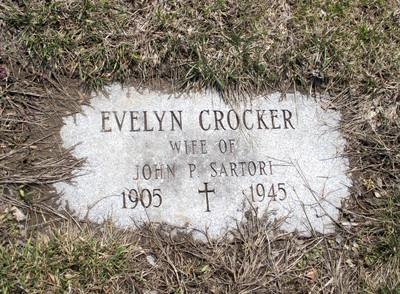 Mrs. Clara E. "Evelyn" (Crocker) Sartori of 37 Florence Street, East Hartford, was born August 12, 1905 in Pittsfield, Massachusetts, daughter of Pittsfield natives Ruby (Sullivan) and Hiram Ward Crocker, Jr. Evelyn, in fair health and suffering from Rheumatic heart disease for several years, fell down the steps while escaping the circus tent and injured her back and suffered from nervous shock. Though not commonly considered a victim of the circus fire, Evelyn's doctor believed that her injuries may have aggravated her pre-existing heart disease, and she died at her home on February 21, 1945 from a cerebral embolism due to her Rheumatic heart. Mrs. Sartori was buried at St. Mary's Cemetery in East Hartford after services at the Laraia & Sagarino Funeral Home. Mrs. Sartori, a housewife, leaves her husband John Sartori; their daughter Miss Phyllis Sartori, 17; and their three sons: John, Jr., 21, of Texas; Robert, 20, fighting in the South Pacific; and Michael, 13. Evelyn's husband and son Michael attended the circus and escaped with minor injuries. Evelyn's estate was awarded $7500 by the arbitration board, comparable to awards made to other women near Evelyn's age who received death settlements.